But we came down this past week on our own personal civil rights tour. 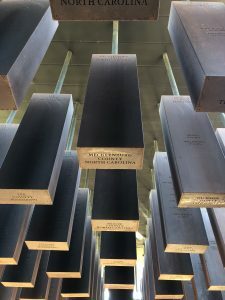 We started in Montgomery, visiting Bryan Stevenson’s amazing Equal Justice Institute, and the National Memorial for Peace and Justice, informally known as the Lynching Memorial. 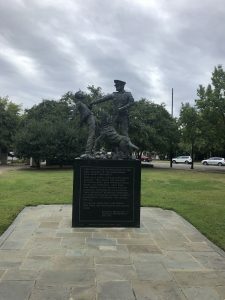 It commemorates the documented murder of more than 4,000 Blacks across the nation, while acknowledging the actual number was many times more. Like tombstones, county by county across the South, the somber steel monoliths honor the slain by name. The Legacy Museum, located at the EJI, is a well-curated exhibit documenting the history of resistance. 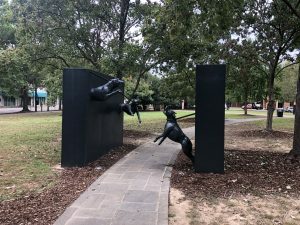 But what was most remarkable about Montgomery was that the City had embraced its path, was indeed leveraging its legacy of racism, as a tool to foster economic development. Blacks and whites co-mingled; we saw numerous mixed-race couples. It’s a beautiful city enjoying a remarkable resurgence tied, ironically, to its past as the home of the famous Montgomery Bus Boycott. Not so much Birmingham. While Birmingham has developed a well-deserved reputation as a foodie capital, the tension between the races is as palpable, if not as violent, as it was 50 years ago. There is no intermingling between black and white. As Willis, the clerk at the Birmingham Civil Rights Institute Gift Shop told me, when White folks pass Black folks, they’ll look down, cross the street, look at their phones. I believed him: We went to dinner at one of Birmingham’s famous restaurants on our first night – Chez Fonfon – located in downtown Birmingham; there was not a single black person at the restaurant in a city that is 62% Black. It was the same situation the next night at OvenBird. Perhaps it’s the power of Birmingham’s self-guided civil rights tour, a winding path through downtown Birmingham that ends up at the Birmingham Civil Rights Institute, a stunningly well curated exhibit of racism and struggle for civil and human rights from the end of the Civil War to the present day. 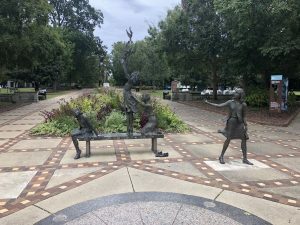 The final approach to the Institute passes through Kelly Ingram Park, a path through statuary that, at its last, reduced me to my knees and tears. It was an extraordinary experience made all the more poignant by the horrific acts of violence that have occurred in the past week, acts that were, sadly, encouraged by our president. I attended, as my final act of “vacation” yesterday a memorial service/peace rally/poetry slam at Congregation Beth Israel to honor the fallen from Tree of Life Congregation in Pittsburgh. I don’t know how we put the evil genie of hate, so carelessly released to foster personal ambition, back into its bottle. But we can do worse than following the lessons so painfully learned through our struggle for civil rights. May God bless you and these United States of America.